Heightened nutritional demands are required to support a baby’s growth and accommodate changes in maternal tissue during pregnancy and lactation. These demands are not always met, leaving women vulnerable to a number of nutrient deficiencies. Considerations to diet, lifestyle and nutrients start with preconception and move through the stages of pregnancy. Giving your baby the healthiest start in life will benefit far beyond the nine months – it will last a lifetime. Does Every Pregnant Woman Need a Multivitamin? In one short answer YES. Prenatal multivitamin supplementation has been shown to assist with infertility, and taking a multivitamin during pregnancy has been shown to provide protection against the likelihood of the baby developing congenital abnormalities such as neural tube defects, cardiovascular anomalies, oral cleft, limb defects, or low birth weight. All women are different, some can feel healthy and relaxed throughout their pregnancies, whilst others have can feel unwell. For some women the pregnancy is planned and for others it may be a surprise, so emotions can also play a part. morning sickness (despite its name, it may happen at any time of the day), usually only at the start of the pregnancy. Seeing ladies through their journey of pregnancy is one of the most wonderful parts of my job. My aim is to empower women through this time and allow them to see it as a natural process that the body is only too capable to achieve. Regular health checks are important, to move through the stages of change seamlessly. Screening to keep a check on nutritional sufficiency and health is important and pathology testing is sometimes required. The end result of a happy, healthy mum, a healthy full term pregnancy and healthy baby is the outcome focus. Trudy has spent the last 12 years in the natural health field, 10 of those as a naturopath. She believes that health is more than the absence of disease. It is the balance of many factors including mental, emotional and physical wellbeing. Trudy enjoys working with a wide range of clients from children to the elderly, athletes to expecting mothers and all who believe they could benefit from the holistic and integrative approach of natural medicine. 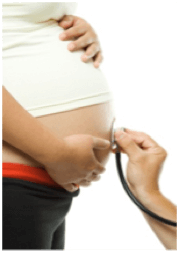 How can Homeopathy help during pregnancy? Homeopathy can support women during pregnancy, breast-feeding mums and children because the ingredients in homeopathic medicines are mainly plants and minerals and are highly diluted. This makes the medicines completely non-toxic making them ideal for use at times when you might not want to take conventional drugs. Lisa practices from our Paddington clinic and uses homeopathy to treat both herself and her family, using this natural therapy during both her pregnancies, labours as well as treating her babies after they were born.